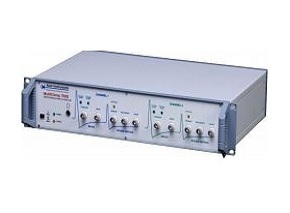 The MultiClamp™ 700B Microelectrode Amplifier is a versatile, computer-controlled microelectrode amplifier designed for patch voltage-clamp (resistive-feedback, four ranges) or high-speed current clamp (voltage-follower, three ranges) recording within the same headstage. The system is ideal for many applications, including high-speed current clamp (sharp-electrode or field potentials), patch clamp (whole-cell, macro-patch, or excised patch), voltammetry/amperometry, ion-selective measurements and bilayer recordings. Major new features of the MultiClamp 700B Amplifier include Internal Automatic Mode switching, triggered by external signals or the recording itself; Oscillation Suppression for better cell protection; and Slow Current Injection to compensate for drifting potentials. Support of up to four headstages makes the MultiClamp 700B System four amplifiers in one. Software control of all amplifier settings for automated optimization features, reduction of manipulation steps, and convenient, reliable telegraphing. Quick Select Feature recalls up to three saved amplifier configurations for fast, reproducible application switching. Optional SoftPanel allows amplifier control using knobs and buttons for a more conventional feel to amplifier control. Integrated seal test in voltage- and current-clamp mode for easy monitoring of membrane and cell health parameters. Dual Command Potentials add flexibility by processing input signals from two different sources. Selectable command sensitivity for flexible control of the output waveform. Pipette offset compensation with auto-mode quickly removes signal offsets. Automatic pipette capacitance compensation requires only the push of a button to neutralize the contribution of the glass pipette and the pipette holder to the capacitance of the circuitry. Series resistance compensation: Prediction helps achieve the desired command level faster by transiently supercharging the membrane potential. Series resistance compensation: Correction improves the bandwidth of the recording by eliminating the error introduced by the voltage drop across the series resistance. Automatic cell capacitance compensation corrects for the capacitance of the cell membrane in whole-cell recordings with a single mouse click. Automatic mode switching enables you to control the transition between voltage and current clamp by an external trigger or depending on the recorded signal. Automatic oscillation detection prevents damage to a cell when electrical feedback occurs. Leak subtraction for automatic correction of leak currents with a smart, software-based algorithm. Selectable output gain with 11 settings to scale the output signal to the desired level. Audio monitor for acoustic tracking of the signal while you are busy looking down a microscope. Fine-tunable 4-pole bessel and butterworth low-pass filters act as anti-aliasing filters and can be used to pre-condition the output signal.